I was never obsessed with Shakespeare. I was never one of those English teachers who strung crepe streamers around the classroom at the end of April to commemorate the bard’s supposed birthday. And prior to this April, I hadn’t even explored Shakespeare’s old stomping grounds. Then, two things happened: First, David – trip leader extraordinaire from my previous posts on Italy – created a 6-day trip to England over spring break for the tenth grade. The trip included two nights in Stratford-upon-Avon, two workshops with the Royal Shakespeare Company, two plays, a trip to the Globe theater, and a little tour around Shakespeare’s and Anne Hathaway’s homes. I was excited, but conservatively so. Then, the second thing happened. While trolling iTunes for a new Bill Bryson book, I came across Shakespeare: The World as Stage, which offered me the tantalizing combination of my favorite author and the guy whose hometown I was about to crash. It was fate. I listened to the audiobook every day on my commute, to the point where I actually looked forward to the potholed trek just so I could hear about this guy. Quite fittingly, I finished the book on the bus journey from Stratford to London, and listened to an interview epilogue on a train in Austria. And so, suitably awed and impassioned, I’ve come up with this list detailing ten of my favorite facts from the book. One of the few things we know for sure about Shakespeare – this was one spelling of his name. 1. First things first: Bryson sums its up perfectly – we know almost nothing about the most famous writer in the English language. Some biographers quip that Shakespeare biographies are only 5% fact, and the rest is conjecture. The guy wrote a ton of plays and poems, but no letters, diary entries, cave drawings – nothing to paint a picture of Shakespeare as a person. Was he friendly, unapproachable, sentimental, pugnacious? We’ll probably never know. 2. What we do know comes from court records, which Bryson notes are not terribly accurate. He gives the example of the clerk recording Shakespeare’s marriage to Anne Hathaway, where her name is printed “Whately,” giving rise to the popular theory that Shakespeare was actually in love with someone else and hastily married Hathaway because she was pregnant. 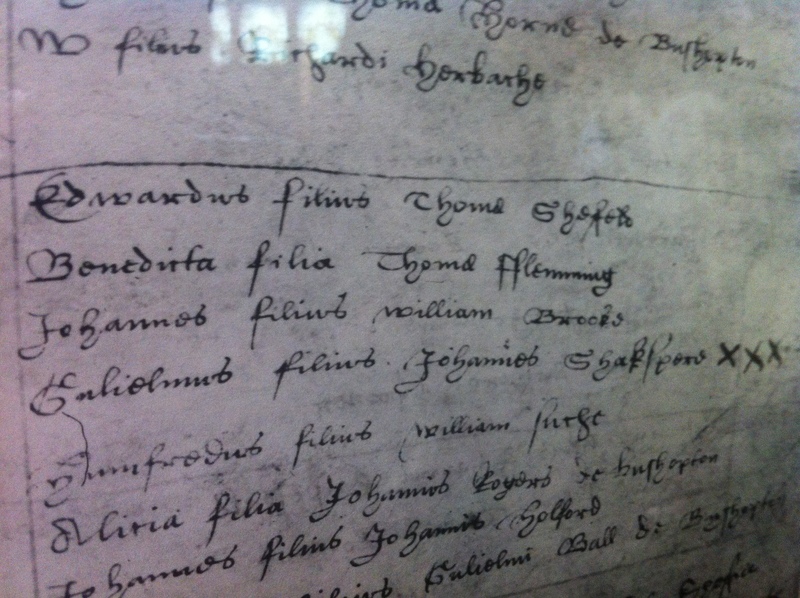 The same clerk, however, didn’t seem to keep very meticulous records, as he also tended to mix up the names of towns. 3. Speaking of popular theories, there’s no evidence that Shakespeare was entangled in some impassioned love triangle. First, according to Bryson, it was not unusual for women to be pregnant prior to getting married. He wouldn’t have had to rush into it for that reason. Second, yes, he went to London, and yes, there’s some reference in his work that his wife was cold – but, as Bryson points out, they went on to have two more children after Susanna, so something was going on, at least in the bedroom. Still, many scholars note the evolution of female roles in his plays and assert that something must have happened to enable him to create multidimensional, believable female characters (as expounded upon in this book that someone should buy me right now) and thus the concept of some starcrossed lover in London, as illustrated by Shakespeare in Love. But who says it was a woman who sparked his passion? 4. Of Shakespeare’s 154 sonnets, the first 126 are addressed to a fair-haired youth. In the introduction to the edition I purchased, Jonathan Bate writes, “It is…striking that dozens and dozens of male Elizabethan poets wrote sonnet sequences, but only Shakespeare and a now forgotten poet called Richard Barnfield addressed their poems explicitly to a man.” Intriguing! Especially since the latter half of the sonnets are addressed to the famous dark-haired mistress, whose eyes are nothing like the sun. 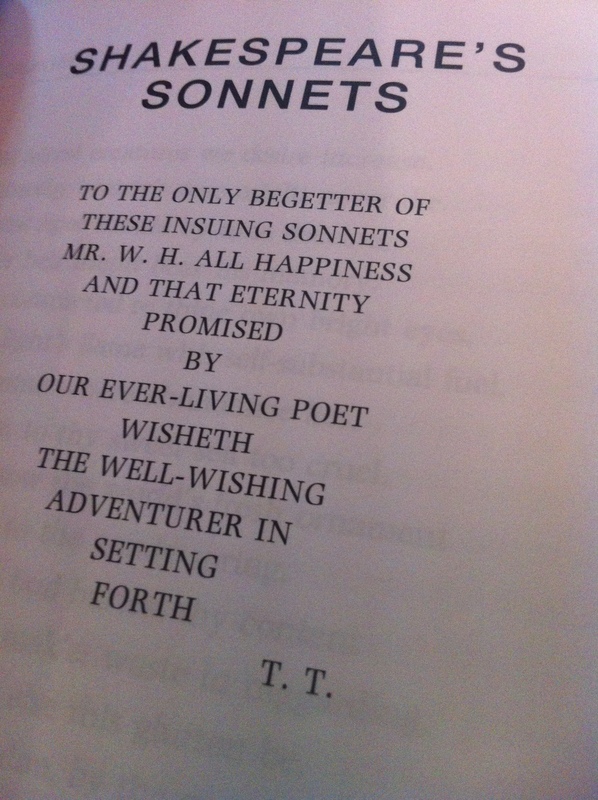 Enter conjecture: Wordsworth saw the sonnets as the key to Shakespeare’s heart. (So much for trying to teach students the difference between speaker and author.) W.H. Auden, somewhat on the other hand, argues that the sonnets should be read and appreciated just as they are, and should not provide insight into Shakespeare’s life…nor should Shakespeare’s life alter our reading of the sonnets. 5. While we’re talking about conjecture, let’s mention the rather disappointing fact that Shakespeare’s “lost years” may never be accounted for. One argument is that he sailed the seas and visited Italy. Of course, the hearty counterargument for this is how ignorant he seemed to be of Italian geography. To paraphrase Bryson, two plays featured sailors setting off from ports in Milan and Verona – neither of which is close enough to a sea to be considered a port. So what was he doing? Was he teaching in the countryside? Carrying on a secret romance? No one knows. If only he’d had Instagram. 6. Actually, Instagram would’ve been exceptionally helpful, because no one is really sure what Shakespeare looked like. There’s one possible portrait, and then two illustrations based off of the portrait. Talk about removal from authenticity. 7. Not only do Shakespeare scholars debate his lost years, there’s a lost play as well. Love’s Labors Won, which is believed to be associated with Love’s Labors Lost (that would make sense, right? ), is listed in places but has never been found. Up until recently, a sizable majority credited it as The Taming of the Shrew under a different name – that is, until a document was found listing both plays on the same bill. I asked one of the actors at our Royal Shakespeare workshop and he assured me with confidence that it’s Much Ado About Nothing. But hey, as with most of this stuff – we may never find out. FRANCISCO: Nay, answer me: stand, and unfold yourself. FRANCISCO: You must come carefully upon your hour. What’s so special about it? Without today’s special effects, scope, and camera angles, Shakespeare manages to convey that it’s night (who’s there? ), that it’s cold (unfold yourself), and that there’s tension among the guard. Without saying any of that outright. 9. Which is possibly why his plays are arguably more well-known than Marlow’s. Especially considering The Merchant of Venice and The Jew of Malta (Shakespeare’s and Marlow’s respectively) are so similar. So there you have it. If you’ve made it this far, you really ought to just buy the Bryson book: it’s slim, and Bryson’s uncontested authorship is the perfect blend of information, humor, and the feeling that you’re having a chat with your favorite uncle about a great, possibly unsolvable mystery. *My next posts will be about my trip to England, during which I immersed myself in Shakespeare with fervor and forbade my students to peruse the MAC counter at the airport until they could recite lines from Sonnet 18. 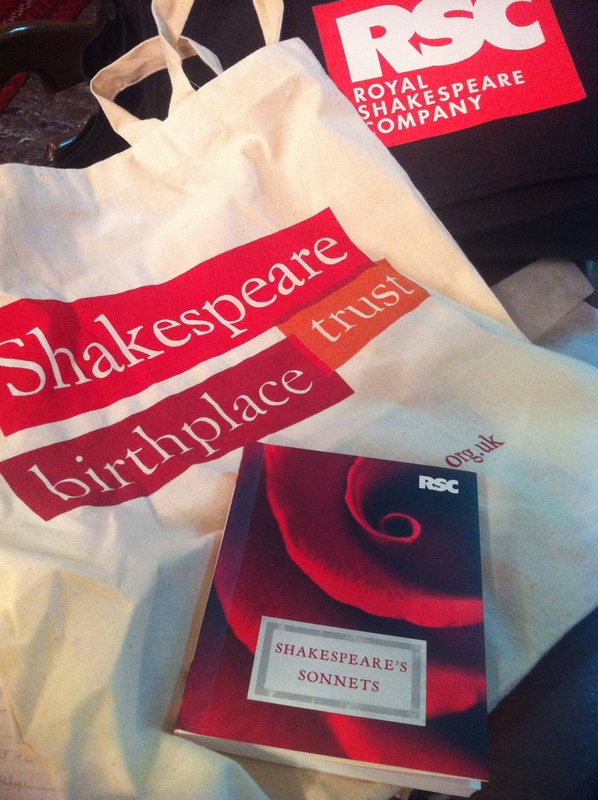 Stratford-upon-Avon is also a haven for English teachers because tote bags.